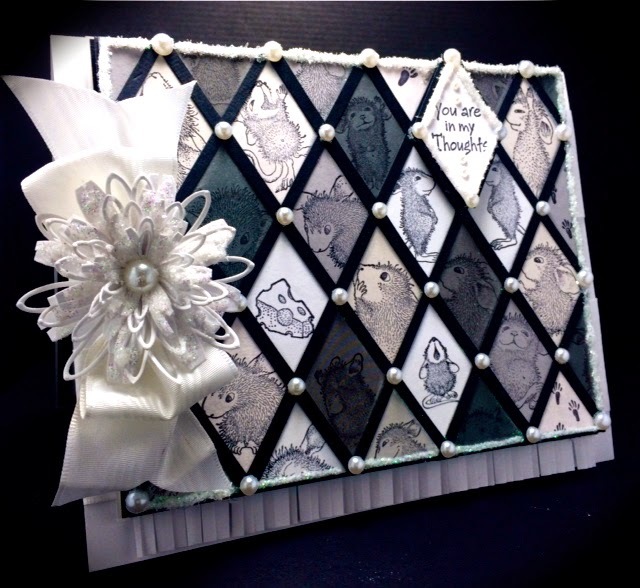 Our Mousey Design Team is dedicating our creations to our lovely Teamies, Sue Drees, and Sue Kment, who are both going through a difficult time in life and so we wanted to let them know that we are thinking of them and their loved ones. :) "YOU ARE IN MY THOUGHTS" is my 2nd card for this theme. I followed the same idea of using multiple images, like with my last card, (found HERE), but changed the elements for a slightly different look and style. What do you think? 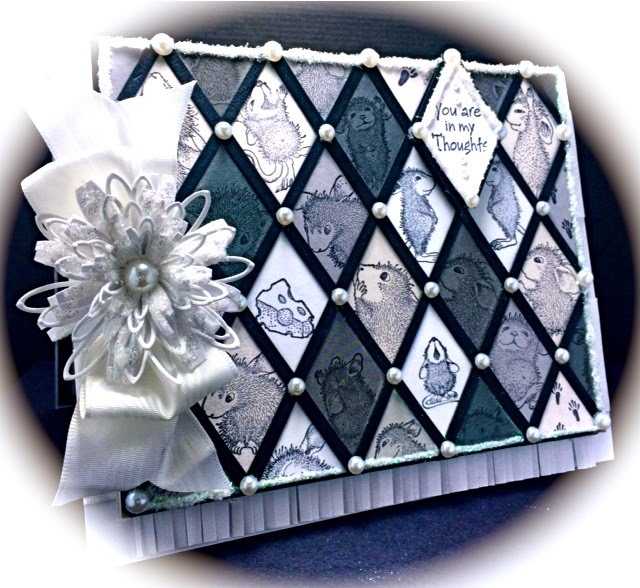 Main Background was created by stamping lots of little mice, cheese and foot-prints on various shades of gray and white, then punched out multiple times with a diamond punch. These diamonds were then adhered onto white CS side by side. The piece was then cut to even out sides and strips of black CS were layered across all the diamonds to create this trellis look. Its then mounted on black CS and placed over a piece of frilled paper cut out with special frill scissors for the look. The finishing touches added are the glitter around borders and pearls placed on all areas where diamonds meet. The lovely flower is actually made with Sue Wilson's multiple Daisy Dies (see below). Some petals are open and others had the edges trimmed (for creating a slightly different and fuller flower look) and then topped with a pearl. Stamps: Stampa Rosa, Stampabilities, Stampendous! 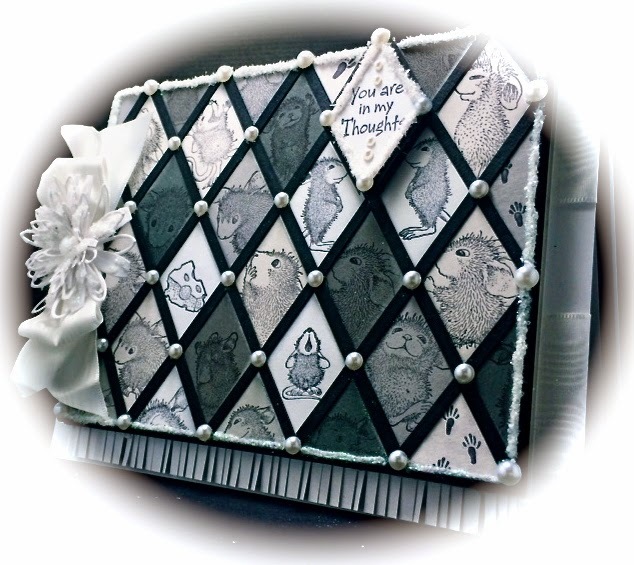 all by House-Mouse Designs®, the sentiment is by Inkadinkado (reminds me of a chalkboard look). Stop by HMFMC to check out the amazing themed creations by my Teamies, HERE. We are proudly welcoming back Heidi and Simon Says Stamp!! AND, this yummy CANDY of House-Mouse stamps and 150+ (silver, gold and copper charms in various themes), to a third LUCKY Player, from yours truly. To WIN my Candy... You must enter a project into this Challenge, Become A Follower (if you are not already), and post a picture of my Candy to your Blogs with a LINK back here. Thank you for stopping by. I cant wait to see your fab "No Coloring" takes and good luck! fab idea and gorgeous card America. America...you've done it again!!! ABSOLUTELY GORGEOUS!!!! You sure did use a lot of stamps...LOVE it!! I just keep looking and looking...LOL!!! America, I so love this design!! You come up with the most awesome ideas using these HM stamps!! Absolutely stunning as always my friend and thanks so much for your comment about my HM cards! :) My style is a bit different than what it used to be!! LOL! Gorgeous card America, love it! So adorable! I love this design. Fabulous card! Thank you for sharing your wonderful creation with us at The Squirrel and The Fox. I am your newest follower and would love to have you follow my blog also. 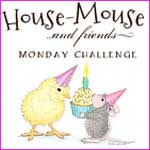 Please join me for a chance to win FREE candy on my blog. Great card... Love the design! Thanks for joining us at The Crazy Challenges. What a really eye catching piece of artwork, thanks so much for sharing your creativity with us at Stamping Sensations challenge. Absolutely gorgeous! 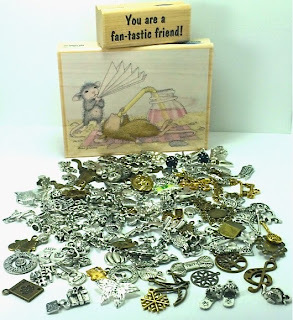 Thanks for joining us at Stamping Sensations.